81C wrote: Intersting to see some else happy with the Manors apart from the cab roof rivets need a piece of sand paper on them they are fine my 4 run perfectly they all have the latest chassis with the flywheel, I find the armchair modeller wanting all their loco's new withinthe past 2-3 years they are unfortunate not to be able to do a bit of handywork on their models these "B" sets which I bought my first one 30 + years ago are a long time coming. Now you mention it the Cab roof rivets do look rather obvious........should they be removed entirely or just reduced in size? Marty wrote: Cracking shot of the Dukedog (weathered, crewed, coaled AND lamped!!) John. I guess I could cut and paste my apology to Bob but that would only compound my rudeness! I am so glad you liked that shot and I am truly sorry that that it has taken me almost a month to tell you! Glad you saw the lamps.....they are a bit of a pain to fit and it does mean locos have to have dedicated roles but to my mind they do look naked without them.......particularly when one knows they would be stopped at the first box without the correct code! I am truly mortified that I failed to thank you for your nice post until today. As I have said earlier I have no excuse other than old age. called their 4 car sets............B sets! "Spending time watching the trains go by" ? Now that will make you old John !! 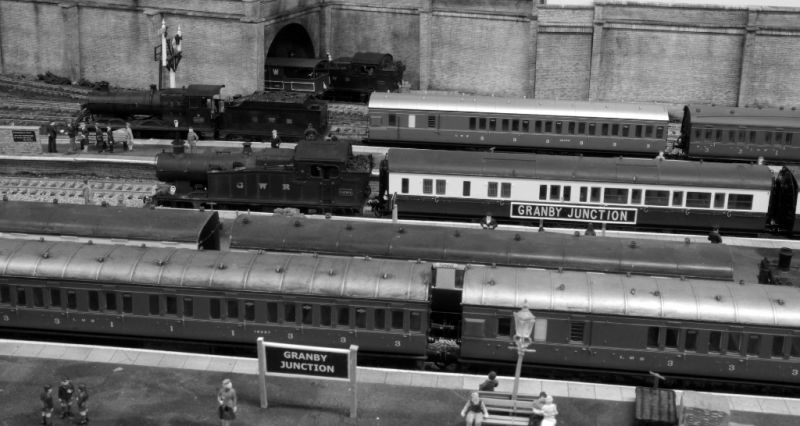 You need to be spending time "filming" the trains go by - I need to enjoy some more of a "live" Granby. No need to apologise John - certainly no offence taken, but it was kind to comment. Another video as penance, please! I had heard that as well........I just hope it didnt extend north of Birmingham to Chester/Granby..........I will make further enquiries. .
Petermac wrote: "Spending time watching the trains go by" ? Now that will make you old John !! Headmaster wrote: I second that! The cast have been busy rehearsing a new production tentatively titled "Coal to Granby" or something equally unimaginative.........but it will be a few weeks before we start shooting. 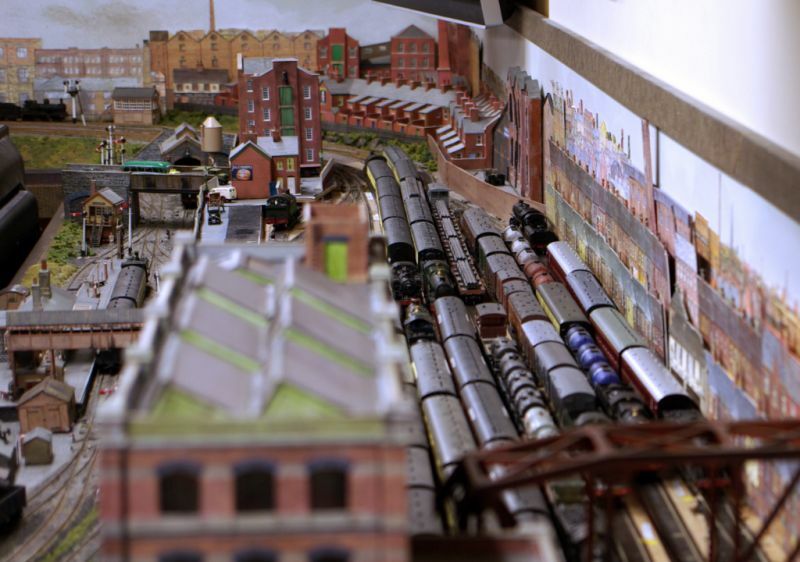 Lots of planning and testing.....quite apart from setting up the uncoupling magnets and RR&Co stop and brake markers I cant have the trains lingering in D5 because it provides the only access to the storage turntable and is the principal down freight route! 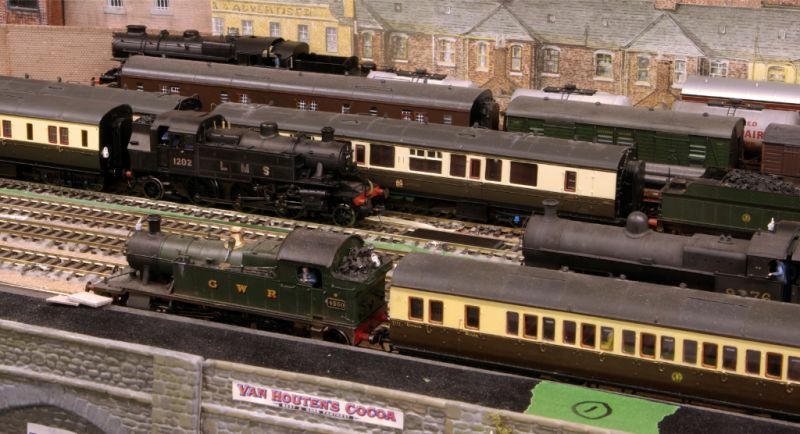 Both Carriages and Loco are temporary understudies. The plan is to eventually use the new Hornby Collet non corridor coaches hauled by the new large Prairie. Hopefully the coaches will be in Vancouver towards the end of March but the Prairies are not expected until the fall. She is a real Granby veteran......in fact I think it was her arrival almost 20 years ago that caused me to stretch Granby's time period to the spring of 1948. She was probably one of the first split chassis locos that I chipped. This was before I appreciated that when it comes to decoders you get what you pay for.....low price doesnt necessarily mean good value. She is still a good reliable runner but lacks the precise stopping I now expect. I have bitten the bullet and a Lenz replacement decoder is on the way. Incidentally, there is nothing too incongruous about a LMS loco hauling GWR stock out of Granby. The Chester-Birkenhead line was a joint railway and I have just stretched the boundaries a little. In fact with a new decoder she may well share duties with the Prairie on a permanent basis. 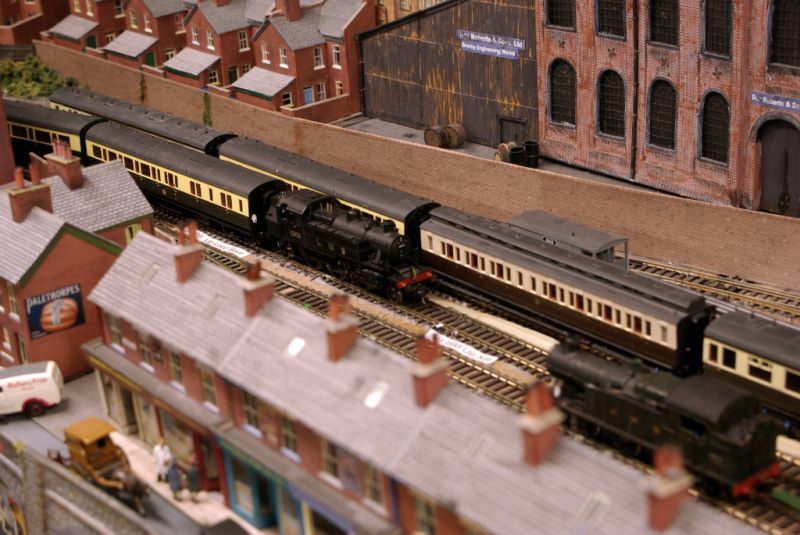 Sorry about the focus.....I needed the shot to show the relief loco temporarily stabled in U2 Up Parcels/Milk trains. Typically I set the stop marker so that the loco overruns the magnet stopping with the coupling 2" in front. After a suitable pause the loco moves back 3" another pause and then having uncoupled.... forward 6".......the Kadee Shuffle. 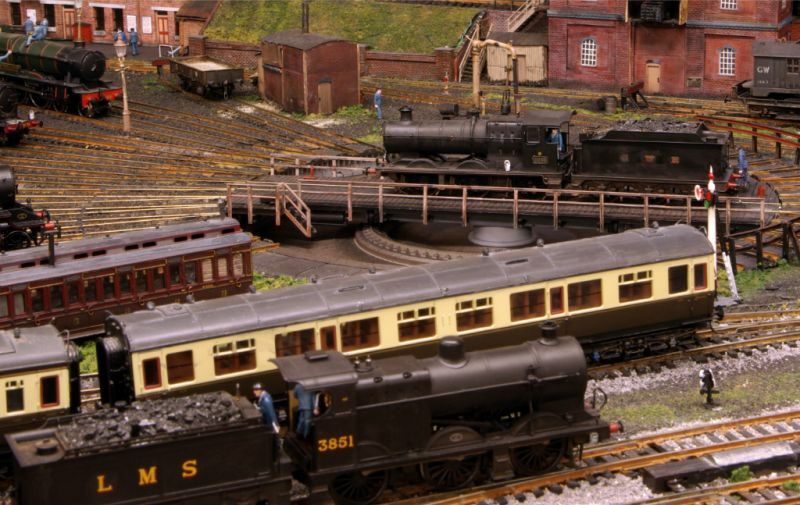 On the right by the back scene with the LMS 4 coach set is D5......LMS coaches are there so it must be Shrewsbury......when 6694 arrives it will become Oswestry! 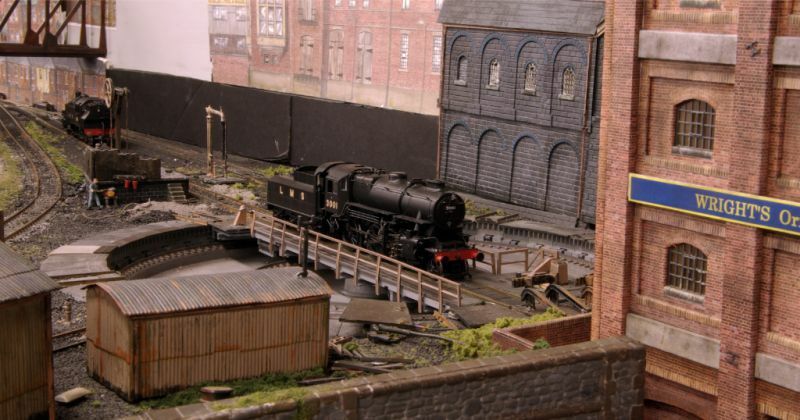 The loco exchange here is much more complex and hopefully I can get some better photos of the process for next week. Good morning John from a frosty but bright and sunny Loire Valley. Your latest post was a lovely gentle and entertaining way to start the day, as you slumber onwards, dreaming of another England performance like the last. Poor France! I can only dream of modelling sessions becoming running sessions, but I'm fascinated with your ongoing work and research with your operating. The varying roof lines and detail of the coach stock in photo 6 is so representative of GW practice and captures the atmosphere of the times wonderfully, not that I was there of course! 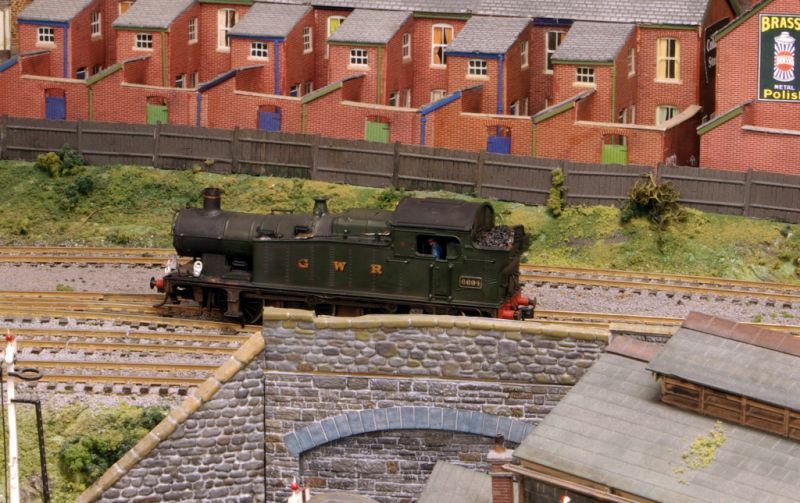 Like you, I too am anticipating the imminent Hornby Collet non-corridor stock and look forward to some gentle weathering. I think the real test will be the week end after next in Cardiff.......I am dreaming about that result! Glad you liked the post.....I try and write regularly but when I am developing automatic routines,which involve so many endless running sessions testing stopping distances etc, I always worry that it will be a bit boring and repetitive. How was the Pendon course......will you be posting about it? Oh yes John, very well worth the effort and getting to Pendon was a challenge sucessfully accomplished in heavy snow and then ice the next morning! I've already booked my next course in May, the advanced weathering one and I'll take my new airbrush along with me! I've a particularly important interview this Friday to prepare for, all in French, so will not be posting much until the weekend at least. Brexit has much to answer for! Ah-ha - the infamous "Carte de Sejour" ...........................? We haven't got ours yet Bill but, from what others have told me, it's not too difficult here in Lot et Garonne. The Gironde I think, is a different matter but then it does include Bordeaux. I'm told getting an appointment is the most difficult thing !!! Sucess, nous avons nos Cartes de Sejours!! Huh, we can now spit in the face of Brexit! Right, sorry John, now back to railway modelling. Longchap wrote: Sucess, nous avons nos Cartes de Sejours!! Huh, we can now spit in the face of Brexit! 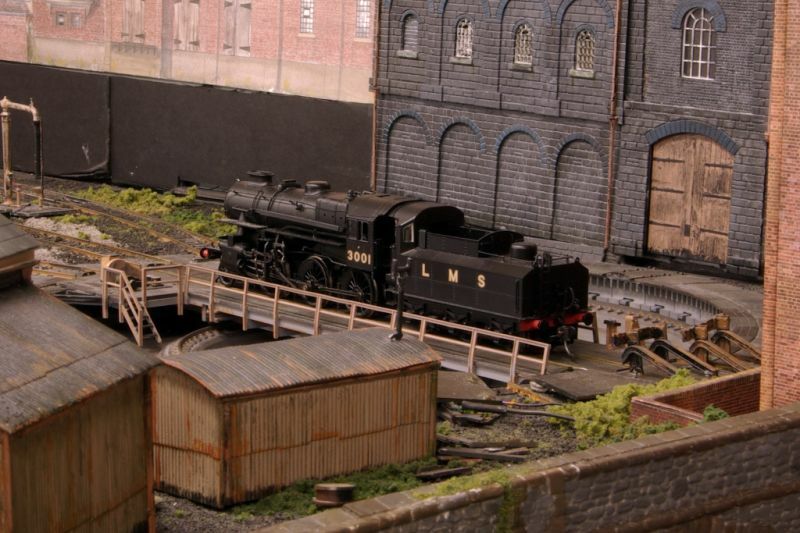 Here we see LMS 4F 3851 at the start of the return journey to Granby. 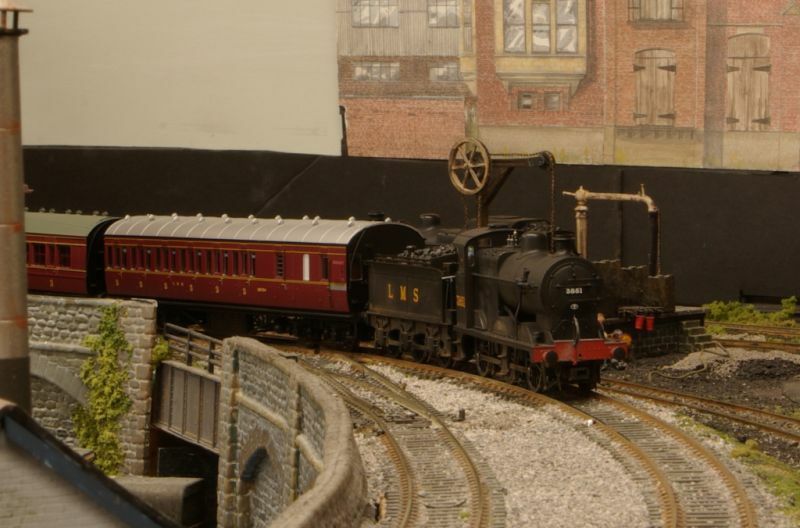 Although primarily used for freight it was not uncommon to see these 0-6-0 locos on local passenger services. 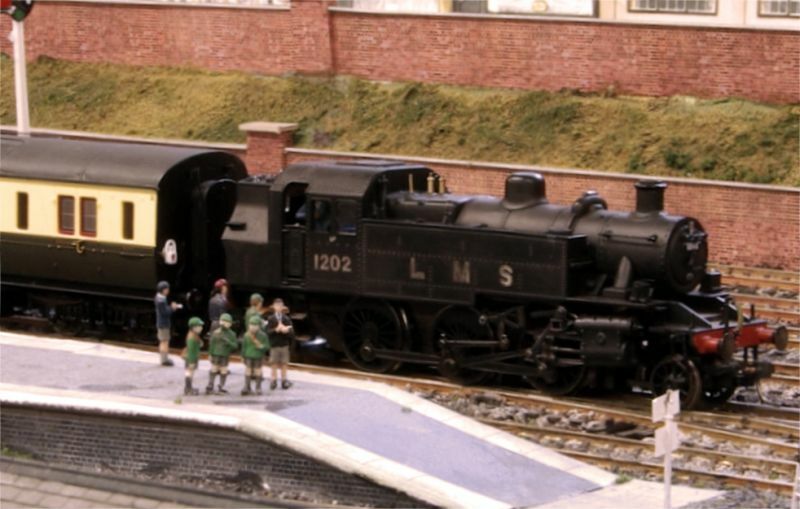 1206, the loco by the coal stage, is another Ivatt 2-6-2T. 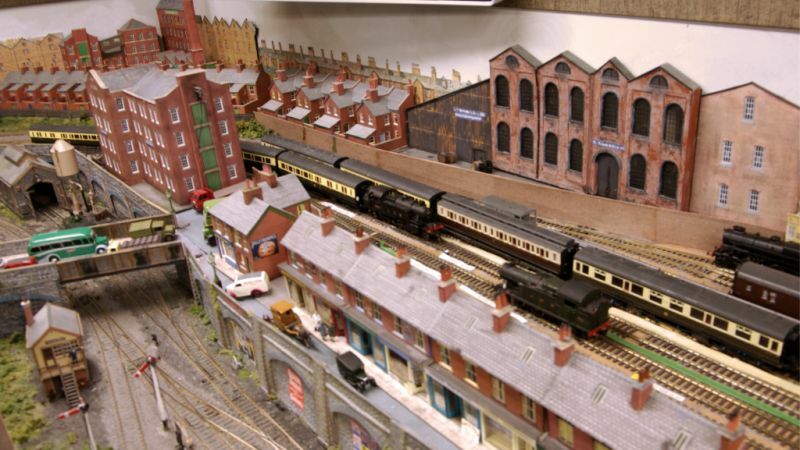 It will eventually relieve the GWR 4 car set which you last saw at the other end of the storage yard. 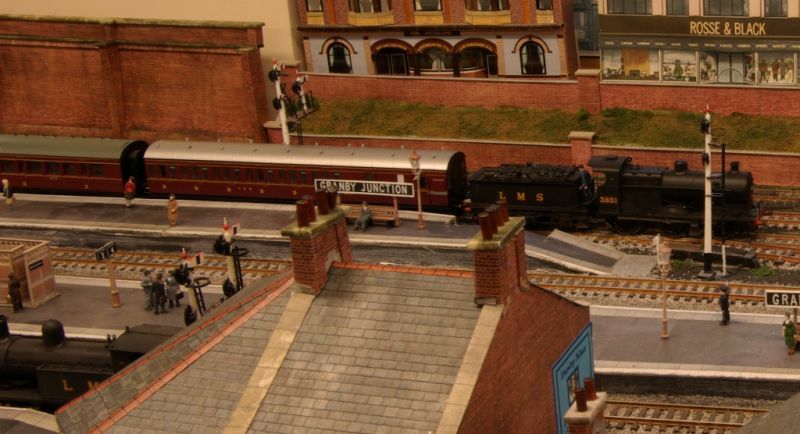 The LMS set will eventually be composed of Hornby's excellent non corridor coaches....Brake 3rd at each end sandwiching an all 3rd and a 1st/3rd composite. This set came about when, before Christmas, Kernow offered the coaches at 25 GBP......amazing value ......current price is close to 40 GBP! Right now its a bit of a mish mash....in my excitement I ordered two in BR livery so I have to wait for the replacements to come back. No head code lamps as yet while I sort out which locos to permanently allocate. 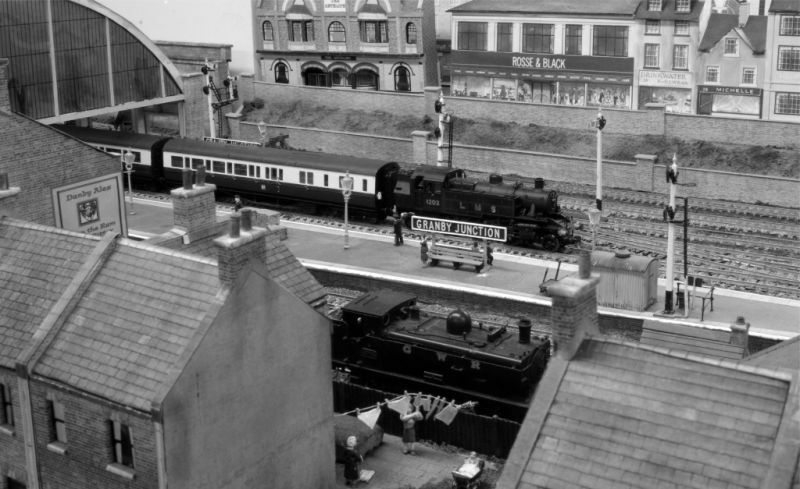 Granby Junction with most of the roof removed showing both the new scratch 4 car LMS set at Platform 6 in the rear and one of the long established north bound sets in Bay Platform 2 in the foreground. Great little story there John giving us photos of Granby from differant angles. Shouldnt worry to much about twisty track thats more prototypical of the time period. Even to this day if you go to Truro station the HST`s coming into the west end of the station go down a thumping great dip and back up again.